FSX/P3D Boeing 737-Max 8 Caribbean Airlines Package. Based at Piarco International Airport, Trinidad and Tobago flag carrier airline Caribbean flies to destinationa around the Caribbean Islands as well as the USA. As of April 2019, Caribbean Airlines has 12 Boeing 737 Max 8 on order with deliveries expected later in 2019. FSX Boeing 737 Max8 model by TDS with upgraded 737-800 VC added. The high spec Boeing 737-Max9 from TDS. The VC is the Alejandro Rojas Lucena/FSND fantastic revised Boeing 737-800 VC model blended with Ken Wiggington's 737Max updates on the default 737 VC. This VC model includes Working wipers (right mouse click on switch) with rain effect. Switches for LCD Screens, EICAS, PFD, MFT. Autobrake switch. Opening pilots window. Cabin Lights switch. Realistic FMC & HGS (HUD). Ground Proximity Warning System (GPWS), More Realistic night VC textures. There are custom CFM eco sounds included for that extra realism. Use - Instrument panel - Util for ground vehicles, doors stairs, fuel truck, buses. New Utility allows Bus, fuel, doors and more. (Go to Views - Instrument panel - Utility). VC added and edited to allow correct VC views, correct jetways and wheel levels. 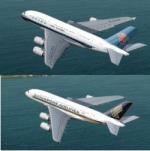 Credits go to TDS fantastic native FSX Boeing Max8 model. I added PDF B737 checklist. See VC docs to get the best out of the VC and FMC. Textures by me. . Assembled and prepared for FSX & P3D up to v4 by Chris Evans. FSX/P3D Airbus A350-900XWB Air France package. Air France are due to have the first of 21 orders for the A350-900 later in 2019. Added the better Thomas Ruth VC with updates by Louis Quintero and Chris Evans. Use FMC under Views/Instrument panel in FSX menu. (FSX : Go to Views -Instrument Panel. P3D: Go to Vehicle - Instrument panel). Added better views. Textures by Chris Evans. The Airbus A350 XWB is a family of long-range, twin-engine wide-body jet airliners from the European aircraft maker Airbus. The A350 is the first Airbus aircraft with both fuselage and wings made mainly from carbon fibre structure. The A350 is intended to replace the A340 and compete with Boeing's 787 and 777. Tested on P3Dv4.3 and should be ok in FSX and earlier P3D versions by Chris Evans. FSX/P3D Airbus A380-800 3 livery package. 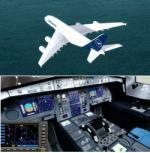 FSX/P3D Airbus A380-800 3 livery package. Includes Lufthansa, China Southern HD and Singapore HD. As of April 2019, China Southern operate 5 A380, Lufthansa operate 14 and Singapore 19. Added the better Thomas Ruth VC with updates by Chris Evans and Louis Quintero. Use FMC under Views/Instrument panel in FSX menu. (FSX : Go to Views -Instrument Panel. P3D: Go to Vehicle - Instrument panel). RR engine sounds. Added the great textures from SLT and Stefan Bree. Added checklist. Includes built in FMC by Garret Smith. Original model by Project Airbus/Thomas Ruth. Tested on P3Dv4.2 and should work in FSX and other P3D versions. Improvements include upgraded panel and textures with HGS, extra views. Zip preview for images. Custom package by Chris Evans Zip preview for larger images. FSX/P3D Boeing 737-900 Nordwind Airlines package with enhanced VC. Moscow based Norwind Airlines began operations in 2008 and now flies to popular destinations around Europe, Asia, the Middle East and South America, and is expanding to more routes. As of April 2019, Nordwind are awaiting delivery of 4 Boeing 737-900. Model by TDS/ Tenkuu Developers Studio with advanced 737-800 VC added. Includes utility for ground services, Passenger bus, cargo, stairs, refuelling truck etc (find it under - Views - Instrument panel - Util) The wonderful native FSX Boeing 737-900 from TDS will be enjoyed by many more people who do not know how to install a VC into a FSX native model. The VC is the Alejandro Rojas Lucena/FSND fantastic revised Boeing 737-800 VC model. This VC model includes Working wipers (right mouse click on switch) with rain effect. Switches for LCD Screens, EICAS, PFD, MFT. Autobrake switch. Opening pilots window. Cabin Lights switch. Realistic FMC. Ground Proximity Warning System (GPWS), More Realistic night VC textures. There are custom Boeing 737 sounds included for that extra realism. Textures by me. Model is not modified in any way. VC added and aircraft.cfg edited to allow correct VC views and jetways. TDS wonderful native FSX Boeing 737-800 model. See VC docs to get the best out of the VC and FMC. Assembled and prepared for FSX/P3D v4 by Chris Evans. Should work in FSX and earlier P3D versions without problem. Textures for the Project Airbus A320 IAE in BOAC "100 Years" livery. Textures only. Shared as freeware, but no redistribution. FSX/P3D Airbus A300-600 Fedex/DHL/UPS package. Fedex currently operate 68 A300 and UPS operate 52. DHL operate 35 via co-operation with Air Hong Kong, ASL Ireland and European Air transport Leipzig. FSX native A300-600F model by Thomas Ruth. Added the better Thomas Ruth VC with updates by Louis Quintero and Chris Evans. Use FMC under Views/Instrument panel in FSX menu. (FSX : Go to Views -Instrument Panel. P3D: Go to Vehicle - Instrument panel). Added better views. Textures by unknown. The Airbus A300 is a wide body twin engine jet liner manufactured by Airbus. As of April 2019, 237 A300 are still inoperation. The aircraft was built between 1972 and 2007. Tested on P3Dv4.3 and should be ok in FSX and earlier P3D versions by Chris Evans. FSX/P3D Boeing 787-8 China Southern Package. Based at Guangzhou Baiyun International Airport and Beijing Capital International Airport, China Southern is Asia's largest airline in fleet size with destinations around Asia, Russia, North America, Europe and Australia. As of April 2019, China Southern operate 10 Boeing 787-8 out of a fleet of over 600 aircraft. The wonderful Boeing 787-9 from TDS will be enjoyed by many more people who do not know how to install a VC into a FSX native model. The VC is the Alejandro Rojas Lucena/FSND fantastic Boeing 737-800 VC cockpit blended with Ken Wiggington's revisions for the default B737 VC to make it more resemble a 787 plus added HUD. This VC model includes Working wipers (right mouse click on switch) with rain effect. Switches for LCD Screens, EICAS, PFD, MFT, HGS. Autobrake switch. Opening pilots window. Cabin Lights switch. Realistic FMC. Ground Proximity Warning System (GPWS), More Realistic night VC textures. There are custom Boeing sounds included for that extra realism. Added Boeing 787-8 checklist. I added the great textures by the Carlos Salas. Fixed views, wheel levels. Added wing views. TDS high spec. native FSX Boeing 787-9 model. See VC docs to get the best out of the VC and FMC. Tested in P3Dv4.3 and should also work in earlier P3D & FSX. Packaged by Chris Evans. FSX/P3D Airbus A350-900XWB Saudia package. Also known as Saudi Arabian Airlines, Saudia was founded in 1945 and is the national airline of Saudi Arabia, based at Jeddah's King Abdulaziz International Airport. Saudia are expected to order either the A350 or the Boeing 787 in 2019, to add more wide body aircraft to their existing fleet of nearly 200, flying to destinations around the Middle East, Europe, North America and Asia. Added the better Thomas Ruth VC with updates by Louis Quintero and Chris Evans. Use FMC under Views/Instrument panel in FSX menu. (FSX : Go to Views -Instrument Panel. P3D: Go to Vehicle - Instrument panel). Added better views. Textures by Emiliano Rujano. The Airbus A350 XWB is a family of long-range, twin-engine wide-body jet airliners from the European aircraft maker Airbus. The A350 is the first Airbus aircraft with both fuselage and wings made mainly from carbon fibre structure. The A350 is intended to replace the A340 and compete with Boeing's 787 and 777. Tested on P3Dv4.3 and should be ok in FSX and earlier P3D versions by Chris Evans. FSX/P3D (incl. v4) Bombardier CRJ-200 United Express package. Based at Chicago O'Hare, United Express is the regional division of United Airlines and operates under various regional airlines throughout the US. As of April 2019, United Express has 187 CRJ-200 in it's fleet. Bombardier CRJ-200 by Iris with new upgraded VC by David Hoeffgen. Includes built in FMC, working wipers and more (see VC docs in folder). High quality model. Fixed views and wheel levels. All credit to the fantastic talents of the Iris team and David Hoeffgen. Added the great textures by Andy Johnson. Tested in P3D4.2 and should work in earlier P3D versions and FSX. Other updates by Chris Evans.